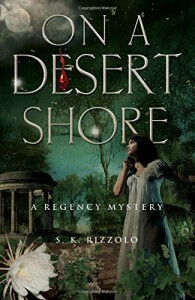 On a Desert Shore by S.K.Rizzolo reminded me of a Georgette Heyer novel. Suspense, family secrets, and murder. Fourth in the John Chase/Penelope Wolfe Regency Mystery Series which has John and Penelope together again. John is hired by Hugo Garrod to find out who is tormenting his mixed blood Jamaican-born daughter Marina. Penelope goes to stay in the household as added security. Not long after, poison is added to the sugar used for tea. Someone putpoison in the expensive sugar that was kept in a teapoy. (An aside, did you know that granulated sugar was not a thing back in Regency times? I also learned a new word, teapoy, a small three-legged table or stand, especially one that holds a tea caddy). The key to this teapoy has gone missing which made it easy to poison the sugar by someone in the household. Tea is served, anyone who used the sugar became extremely ill including Hugo Garrod. He eventually dies and now the race is on to find the killer. John and Penelope believe that it is someone in the household and Hugo's family believes it is the illegitimate daughter Marina. Strange occurrences continue, all leading towards Marina's guilt. John must figure out who among the many suspects, would benefit mostly from Mr.Garrod's demise. Underlying issues include slavery, prejudice and its impact on people of mixed color from another country such as Jamaica. Fortunately, in this time, there were some laws to protect those of mixed color. I enjoy these types of mysteries, always a good story to them. Unfortunately, I have not read the first three in the series so some of the back stories of John and Penelope were not known to me. The reference to John's son Jonathan had me stumped also. None of this detracted from me enjoying the book, though. If you love a Regency type historical mystery, then give this series a try!